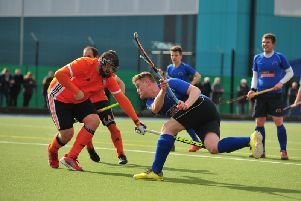 Harrogate Hockey Club Mens 1s played out a goalless draw with North Division One title-chasers Leeds 2s in their first game back after the festive break. Despite the scoreline, the game was an entertaining spectacle with both teams spurning clear opportunities to grab maximum points. Leeds’ talented young goalkeeper pulled off a number of notable saves to deny Andy Clemerson and Chaz Edmondson, while Toby Harris smashed a close-range volley over the bar as ‘Gate pushed their visitors hard. The home defence nullified the Leeds threat in open play, but had their own keeper Rob Stanworth to thank for some important stops following a series of short-corners as the teams were forced to settle for a share of the spoils. A point took Leeds back to the top of the table, while ‘Gate climbed two places to sixth. Harrogate 2s welcomed Yorkshire Premier Division leaders Bradford 1s to fortress Granby. The hosts were looking to redeem themselves after a 7-1 drubbing in the reverse fixture earlier in the season and started the game strongly. And it was ‘Gate who would draw first blood after a surging run through the centre of midfield and pin-point pass from Oli Jordan found Russ Bowen at the far post, the latter coolly slotting home from close range. The home side continued to pile on the pressure looking to extend their lead, but failed to take their chances. With half-time approaching, Bradford pounced on a loose ball and broke at pace into the Harrogate circle. A misplaced pass then eluded Gate’ keeper Nick Hudson and the ball nestled in the bottom corner of his goal, making the score 1-1 at the break. The second period commenced with each team enjoying spells in the ascendancy. Bradford then stepped up a gear and a prolonged period of possession was rewarded when the ball broke to an unmarked forward, who slotted home a reverse-stick shot for 2-1 with 14 minutes to play. The closing stages of the game proved a nervous time for the visitors as Gate’ pushed for an equaliser, but they were unable to find a way to goal and the West Yorkshire outfit survived through to the final whistle. Harrogate Mens 6s took on the club’s 5th team in what turned out to be a well-contested affair played in good spirit. The 5s ran out deserved 7-3 victors in the end, but the 6th team gave a good account of themselves. The losing side’s goals came from Julian Baker, Adam Organ and Xander Parker-Walton, and despite the loss, the 6s were able to take plenty of positive from their performance. Harrogate Ladies 3s travelled to Colne Valley on Saturday and fought back from going down a goal down in the first half to earn a 1-1 draw. Twenty-four hours later, the 3s entertained top-of-the-table Hull University. ‘Gate fell behind early on but had got themselves back on terms by the interval. The students got their noses in front for a second time, but some stunning hockey saw the hosts net three unanswered goals to wrap up a fine 4-2 triumph over the high-flyers.